They name this foster child Buddy, who then sets out into the dinosaur world to discover what kind of species he is, utilizing the time-traveling Dinosaur Train to meet new dinosaurs from the Triassic, Jurassic, and Cretaceous periods. Buddy is scientifically inclined, and as he meets new species, he observes their features or behaviors, then announces “I have a hypothesis!” (it’s basically his tagline), after which he makes inferences on the purposes of horns, long snouts, ridged backs, etc. 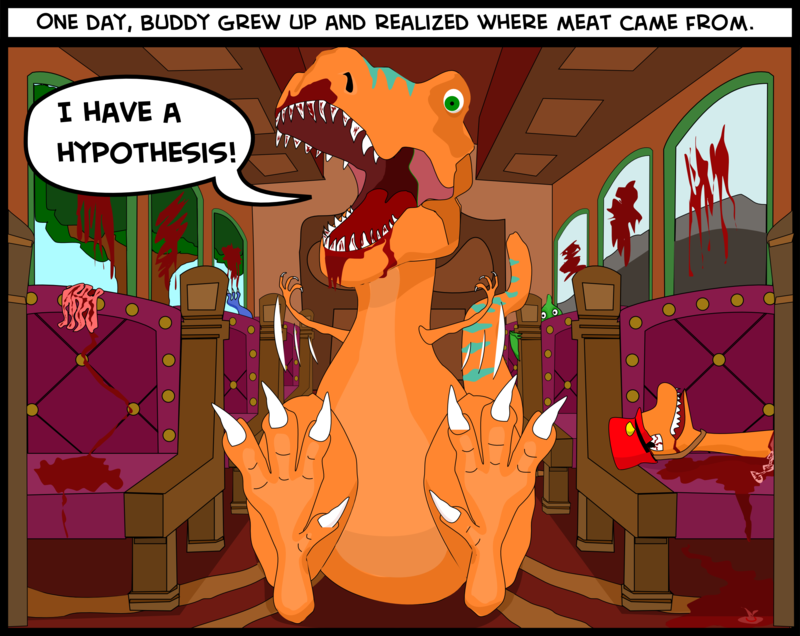 He uses the scientific method to eventually figure out that he’s a Tyrannosaurus Rex. However, this comes in second to when the Pteranodon family meets a dinosaur whose primary prey is…Pteranodons. Being the ever open-minded, non-judgmental family, they engage the creature in dialogue, but only after being assured “It’s okay, I’ve already eaten today.” Oh..okay, Jeffrey Dahmer, then let’s chat! This entry was posted in Cultural Crazies, Glyphs and tagged Buddy, Carnivore, Dinosaur Train, Herbivore, I have a hypothesis!, Meat Eater, Mr. Conductor, Tyrannasaurus Rex by frick. Bookmark the permalink.